Middleware intercepts traffic between the client and the API (whether real or simulated), and allowing you to manipulate it. You can use middleware to manipulate data in simulated responses, or to inject unpredictable performance characteristics into your simulation. Middleware works differently depending on the Hoverfly mode. Middleware is applied after rendering the templating functions (see Templating) in the response body. You can write middleware in any language. There are two different types of middleware. Hoverfly has the ability to invoke middleware by executing a script or binary file on a host operating system. The only requires are that the provided middleware can be executed and sends the Middleware JSON schema to stdout when the Middleware JSON schema is received on stdin. Hoverfly can also send middleware requests to a HTTP server instead of running a process locally. The benefits of this are that Hoverfly does not initiate the process, giving more control to the user. The only requirements are that Hoverfly can POST the Middleware JSON schema to middleware URL provided and the middleware HTTP server responses with a 200 and the Middleware JSON schema is in the response. 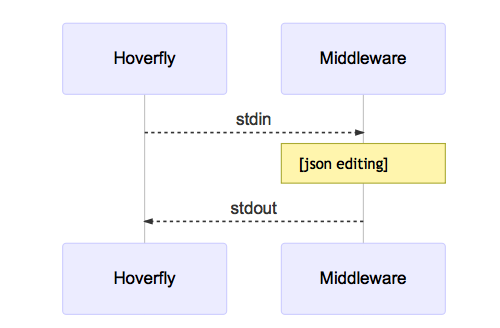 When middleware is called by Hoverfly, it expects to receive and return JSON (see Simulation schema). Middleware can be used to modify the values in the JSON but must not modify the schema itself. Hoverfly will send the JSON object to middleware via the standard input stream. Hoverfly will then listen to the standard output stream and wait for the JSON object to be returned. Middleware examples are covered in the tutorials section. See Using middleware to simulate network latency and Using middleware to modify response payload and status code.